Which leads from your last campaign are valuable and which ones aren’t? To determine the sales readiness of leads, marketers increasingly use lead scoring functionality in their marketing automation system. Lead scoring is a way to measure the likeliness of a commercial opportunity for a potential customer. The lead score helps determine the next best step such as transferring a lead to the sales department or triggering a certain nurture flow. Lead scores on the different conditions of a profile can typically be categorized as “critical,” “important,” “influential” or “negative.” A more positive condition will typically receive a higher score. Negative criteria have a negative score. Critical conditions can also be set as a condition. For instance, when a company is not based in the U.S., it’s not considered a lead at all. But a flat “overall” score isn’t very intelligent. Although easy to use and better than nothing, a unified score doesn’t say much about interest in specific topics, the type of persona or the phase a lead is in within the buyer journey. 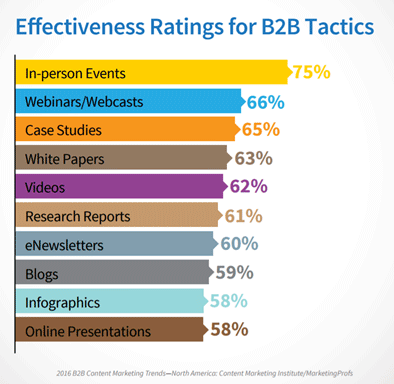 How can you determine the real “DNA” of your leads to take the next best content step? 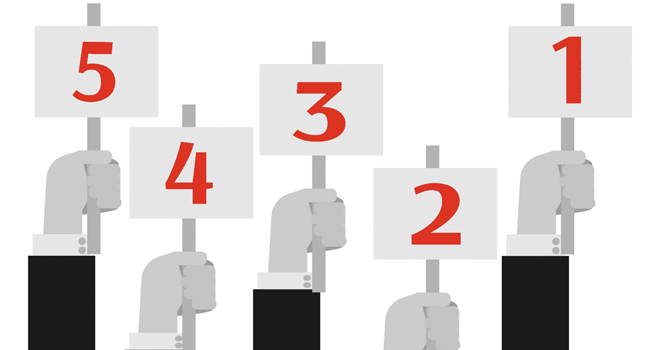 Let’s take a look at five key dimensions in lead scoring. The lead grade presents a qualitative rating of all explicit profile information. For example, someone who sells CRM software to retailers and has more than five stores and launches a campaign with e-books, webinars and blogs. It will probably apply a high explicit lead score to download profiles from retail companies. There may be an even higher grading for profiles of larger retailers with multiple locations and profiles with relevant positions. However, a download by a major IT service provider will get a low (or negative) lead score. Thus, the lead grade actually indicates the extent to which a profile meets the ideal customer. Today, explicit scores are frequently embedded in cost per lead campaigns you create with publishers and marketing agencies. For instance, you can pay $50 per lead when your white paper is downloaded and the “lead” profile meets a certain set of conditional criteria. This singular way of scoring behavior is logical when your company sells one type of product such as a CRM system. 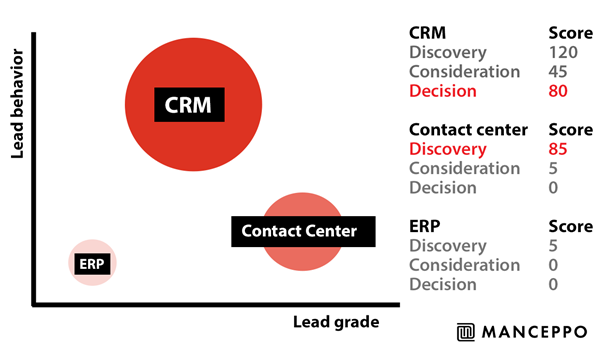 But when you sell both CRM and ERP systems it makes more sense to set up a behavioral score per product line or, even better, per area of interest. For this, your content and/or campaign assets (like landing pages, emails and webinars) need to be tagged per topic or proposition. Also, your marketing automations system needs to support multiple lead scores. Together, implicit and explicit scores can give a good indication of the interests and characteristics of an individual person. This provides a great opportunity to determine your next best step communicating your content. However, in many B2B investment decisions, multiple stakeholders or buyer personas are involved in an organization. They are the decision-making unit. Therefore, it’s relevant to know whether multiple employees from the same organization are captured in your lead database and whether these individuals have interests indicating a certain need. For example, when a marketing manager from a retail company downloads your e-book on the integration of email marketing and CRM and an IT manager from the same organization downloads an article about CRM in the public cloud then that may indicate a CRM project within that organization. Account tracking brings together these signals from one organization into the account score. Successful B2B marketing departments have a seamless process to transfer sales-ready leads from the marketing department to the sales organization. MQLs are now SQLs. It’s necessary to define these clearly with a service level agreement. The lead score can provide a solid criterion for this action. 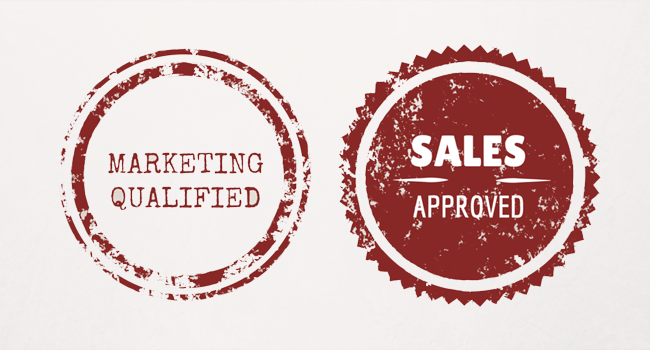 Marketing-qualified leads (MQLs) — These are leads with a low lead and account score because they are in an early phase of the buying process. This pool of leads lends itself to lead-nurturing initiatives. It’s the marketer’s primary responsibility to further develop these leads. When the lead or account score reaches a certain point, the leads are taken over by sales. Sales-qualified leads (SQLs) — When there is an actual need, the position is relevant and the lead fulfills the necessary criteria, it becomes a sales-qualified lead. This is the moment the lead is passed to the sales department. Because content is tagged per buyer stage, the lead in the buyer’s journey can be derived from the lead score. Journey stage scoring is progressive, so if a profile scores high on the “consideration” phase but higher on “discovery,” you can assume that “consideration” phase has actually begun since this phase is closer to the moment of purchase. An interesting article and video about this methodology can be found on this ETUMOS blog. The lead in the “DNA” visual above is theoretically in the market for CRM software and may eventually be interested in call center solutions. For call center solutions, the “grade” profile has an even better match. Finally, the profile has shown some interest in an ERP system but it is not significant enough to act upon. A DNA profile based on all lead scoring dimensions would be ideal for every marketer, and this ideal gets closer as tools mature. To get started with lead scoring, however, get the basics right first. Current best practice shows us that marketing automation systems in the field of lead tracking functionality still differ widely. But within a well-oiled marketing machine, clear insights into the DNA of your leads should be top priority.